Vegetative propagation of plants by rooting of cuttings (cuttage) was successfully used hundreds of years before there was any study, much less understanding, of the underlying biological processes. For some species, cuttage was old practice even in antiquity, as evidenced in the writings of Aristotle (384–322 B.C. ), Theophrastus (371–287 B.C.) and Pliny the Elder (23–79 A.D.). But cuttage was never successful enough to fulfill all then-current public and commercial demands and it still is not [e.g, see chapter by Howard in this volume]. In addition, organ formation has long been a study area within plant morphogenesis (Went and Thimann, 1937), which has made adventitious rooting of academic botanical interest. 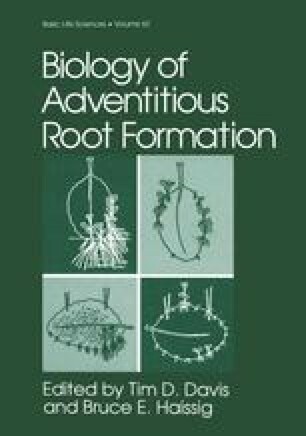 Hence research on the fundamental biology of adventitious rooting began and continues.